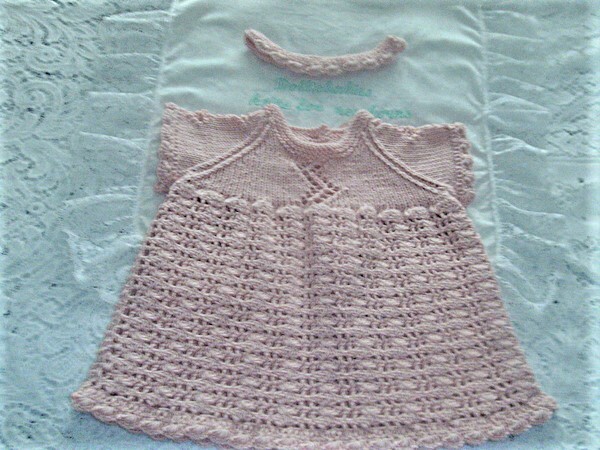 Instructions for a girl's dress set comprising of a short sleeve dress and headband. You will need to be able to both KNIT AND CROCHET to complete this pattern. The skirt area of the dress is crochet, as is the headband. The bodice area is knitted, along with the sleeves. As I class myself as a beginner crocheter, this pattern is easier to do than it looks. The crochet areas are purely trebles and chains, whilst the knitted areas are worked in stocking stitch, with a lace panel insert. However, you will need to be able to pick up knitted stitches to complete the whole set. 150g 4ply yarn, 3 buttons, 3 stitch holders, 2 stitch markers, 1 x 2.75mm crochet hook, 1 x pr 2.75mm needles making a tension of 30sts and 38 rows to 10cm square over knitted stocking stitch. 150g 4ply yarn, 3 buttons, 3 stitch holders, 2 stitch markers, 1 x 3.25mm crochet hook, 1 x pr 3.25mm needles making a tension of 28sts and 36 rows to 10cm square over knitted stocking stitch. 200g 4ply yarn, 3 buttons, 3 stitch holders, 2 stitch markers, 1 x 3.75mm crochet hook, 1 x pr 3.75mm needles OR dk yarn and 1 x 3.25mm crochet hook, 1 x pr 3.25mm needles making a tension of 26sts and 34 rows to 10cm square over knitted stocking stitch. 200g dk yarn,3 buttons, 3 stitch holders, 2 stitch markers, 1 x 3.75mm crochet hook, 1 x pr 3.75mm needles making a tension of 24sts and 32 rows to 10cm square over knitted stocking stitch. 300g dk yarn 3 buttons, 3 stitch holders, 2 stitch markers, 1 x 4mm crochet hook, 1 x pr 4mm knitting needles making a tension of 22sts and 30 rows to 10cm square over knitted stocking stitch. This pattern has been designed by myself so it is entirely in UK terminology. It does not follow the usual ‘shop bought’ format. There are 5 printed pages with clear and easy to follow row by row instructions. All my patterns are tested by independent knitters and crocheters before they are released, so every effort is made so that they come to you error free. Although my patterns are strictly protected by copyright, which I ask you to respect, I am more than happy for any items made from my patterns to be sold. Please allow 24 hours for manually emailed PDF delivery, especially for international customers, as your daytime, might be our night time. If you have not received your pattern after 24 hours, then please contact me. Happy knitting, and in this case, happy crocheting too!